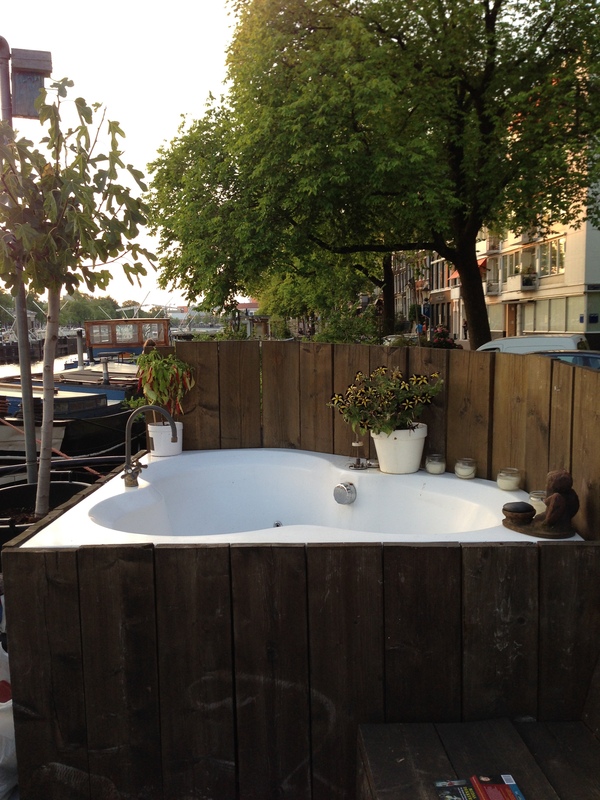 One of my favorite features of Amsterdam is the ubiquity of houseboats (topped with gardens) bobbing in the canal. 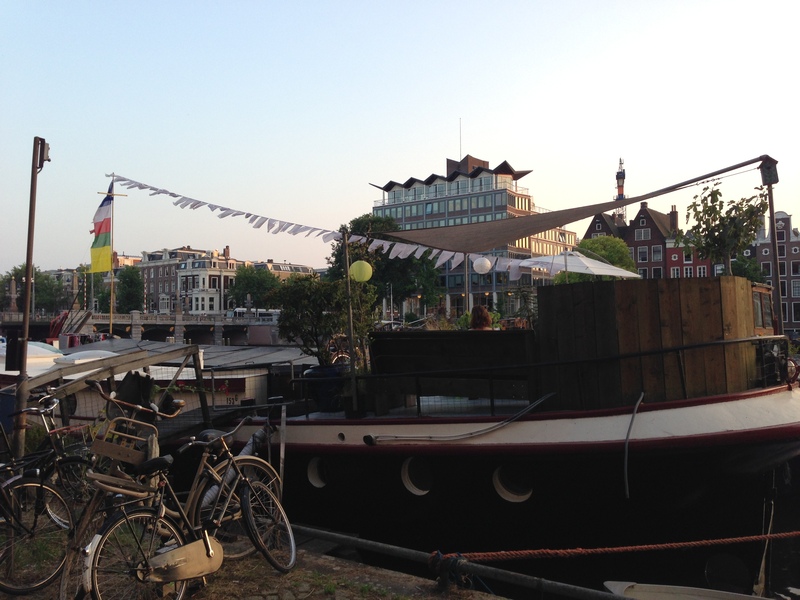 While strolling down the Amstel, I spotted Annelou sipping white wine on her deck, and asked if I could interview her about life on the canal. She invited me in for a drink and a tour! 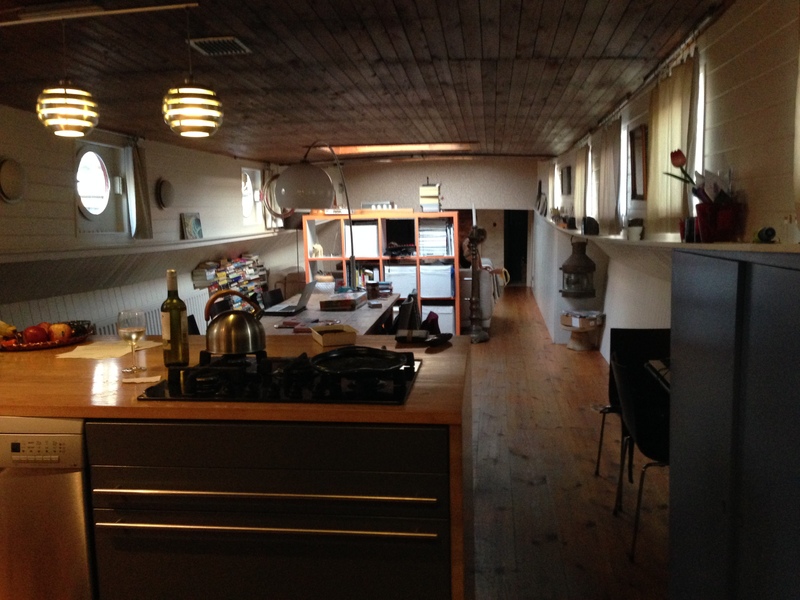 For how long have you been living on this houseboat? And what brought you here, how did you decide to live here? We needed a home, because I was pregnant. And I thought everything was stupid, and then we found these two boats, and I was in love straightaway. So did you raise your child here on this boat? Yeah! I have two children. But you have to keep a close eye – never [leave them] alone on the deck. You can’t make them learn to swim earlier than normal, so you have to watch them. 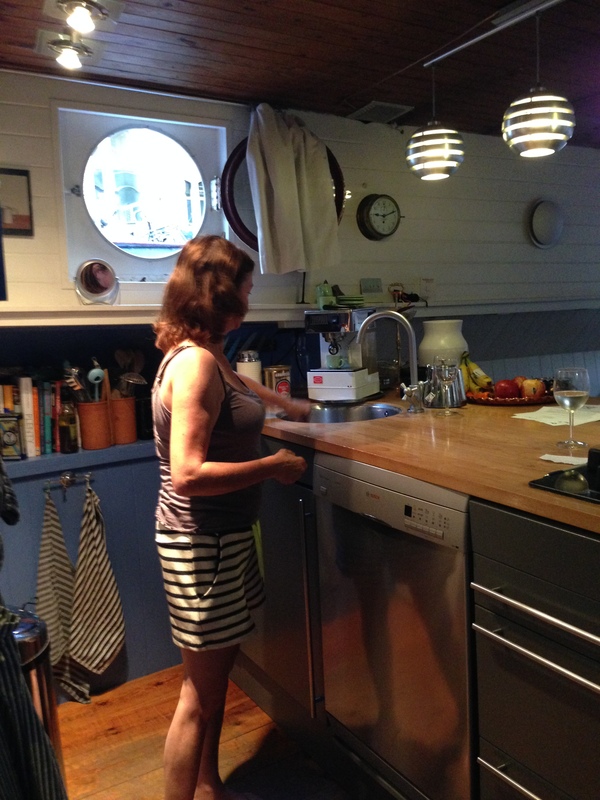 Was it hard to be pregnant on the boat – you’re already feeling nauseous, right? Do you get used to it? Yeah. You really get used to it. The first week it was weird. When you work on the land, and I was behind my computer, and everything was like moving. But, after a week, not a problem. And the children, too. 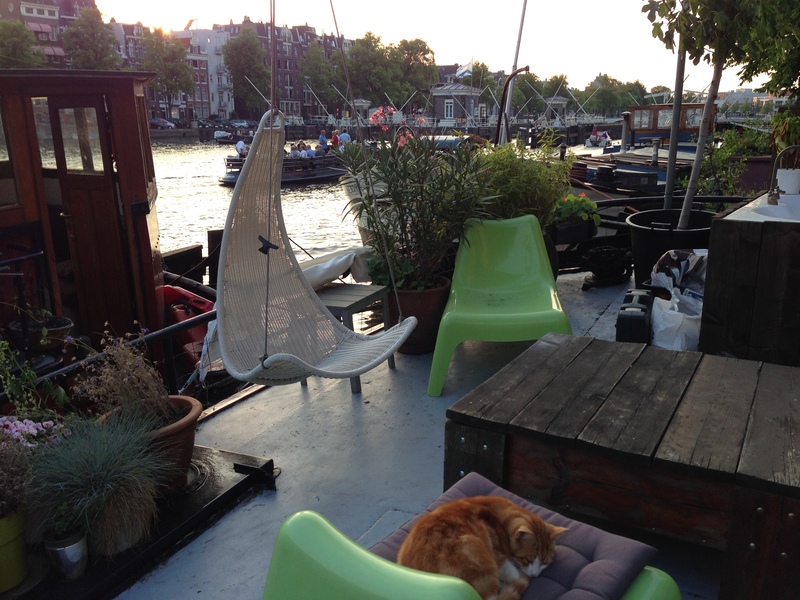 What’s your favorite part about living on a houseboat? What’s the best part? Are there any inconveniences? Anything that’s annoying? It’s not big. But it’s cozy. It’s not high, so you have to be small to live in it. Otherwise you’ll go crazy! You can’t shower, you’ll have to shower like this (cranes her neck). So, it’s for small people. It’s good. We have central heating, running water, electricity, bathroom, toilet, it’s all there. 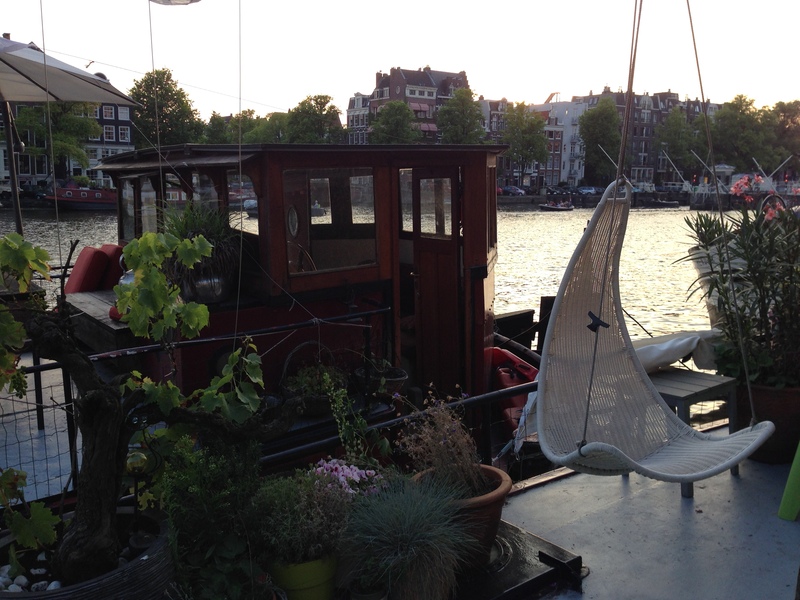 What’s your favorite spot in Amsterdam? Where’s your favorite place to spend time? Like, on a Saturday, what’s your favorite thing to do? I’ll do my walk on this street across here. There is a nice market at the end. So I always go there, because they put out food to try. So I go there hungry. And Albert Cuyp market. I like to go there and buy plants and just walk around. If someone’s visiting Amsterdam, what should they be sure to see? 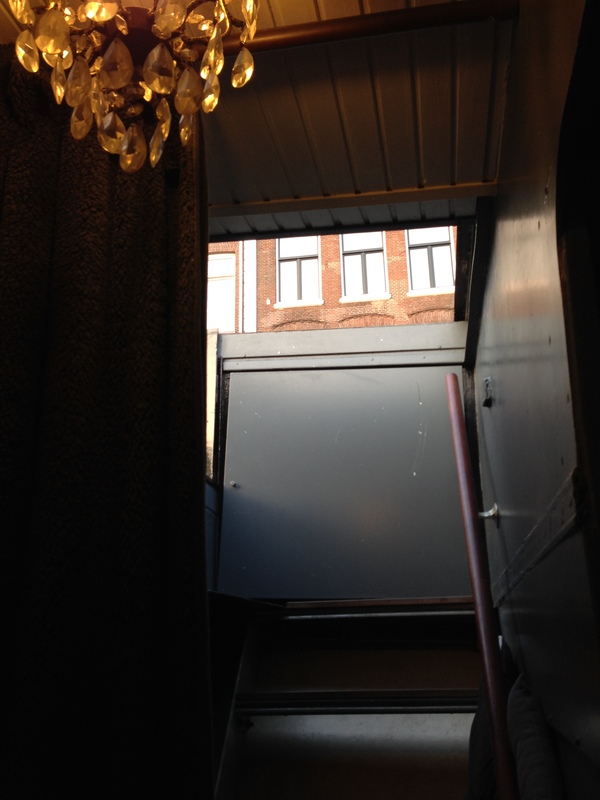 Anne Frank House. Definitely. And get an electrical boat and – not go into town – but go outside. You can swim there, and picnic. 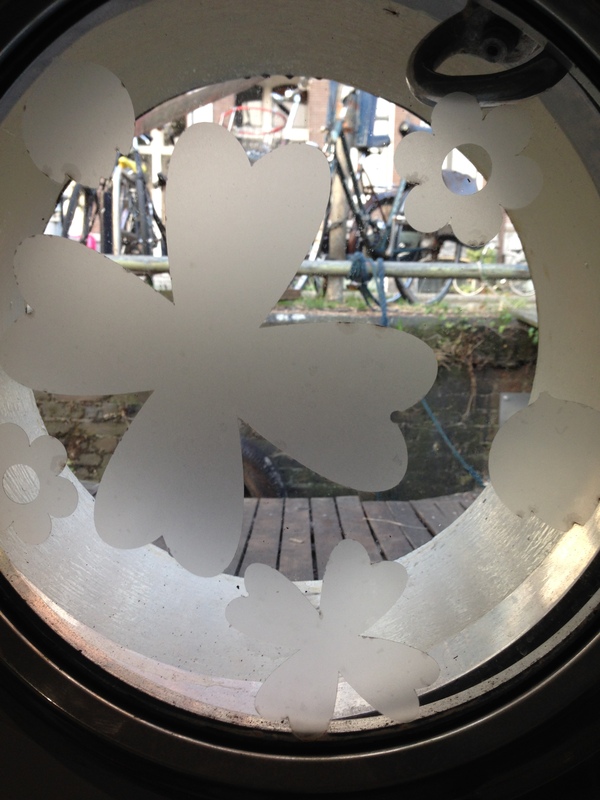 Anything else you wish people would know about Amsterdam? Don’t walk on the lanes for the bikes. Annelou says that her favorite part of every morning is taking a shower and peering out her window. She can watch all of the people walking and biking past, but they can’t see in! 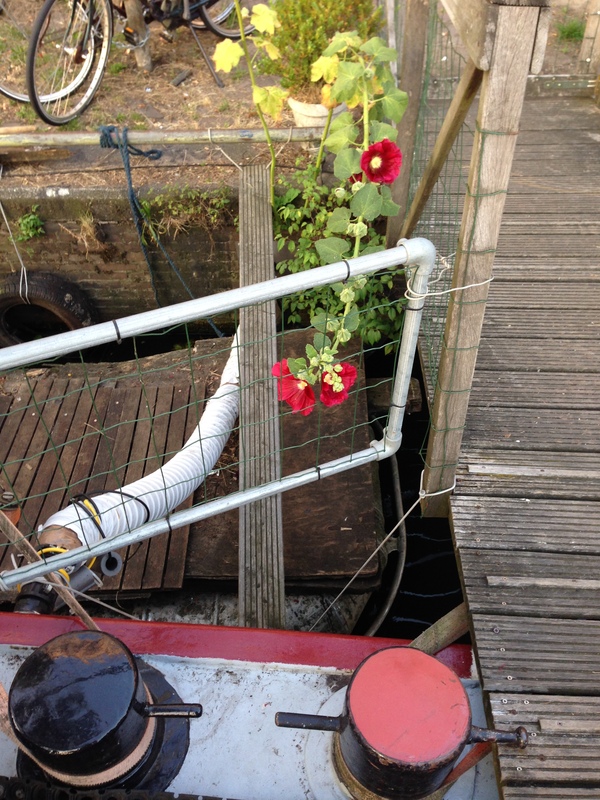 Annelou’s boat is even equipped with a tiny plank just for the cats (Binkie and Bas) to come and go as they please. What a cozy, tranquil, home – planted in a bustling city, yet tucked away from the crowds. Thank you for inviting me into your home, Annelou! I hope you enjoyed the rest of the summer evening!